This Creamy Red Lentil Butternut Squash Soup is one of my soup recipes that I consider a powerhouse soup. What do I mean by that? Well, it’s a soup that’s loaded with nutrients and won’t leave you hungry 30 minutes after you eat it. One powerhouse ingredient that I use in many of my recipes is plain Greek yogurt. If you’re ever looking for ways to boost the protein in a recipe, add Greek yogurt. Six ounces of Greek yogurt typically contains 14–17 grams of protein. Yogurt also contains a unique package of nine essential nutrients that are key to a healthy diet. 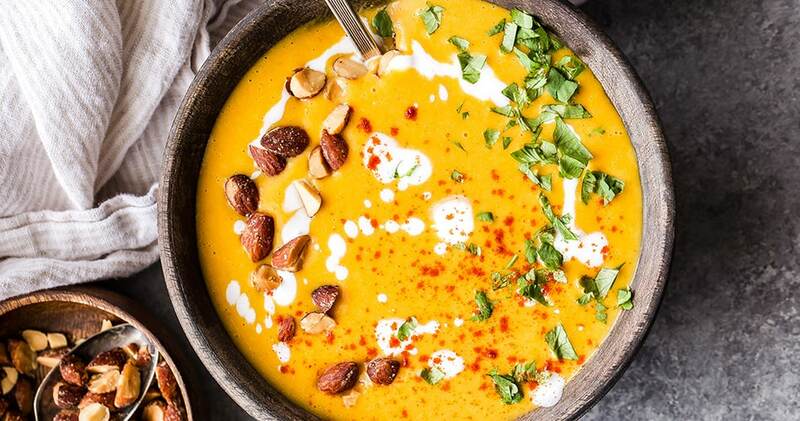 Experts recommend three servings of dairy foods every day and adding Greek yogurt to this soup is one way to help get you there. Yogurt is also a lower fat alternative to higher-calorie ingredients like heavy cream. 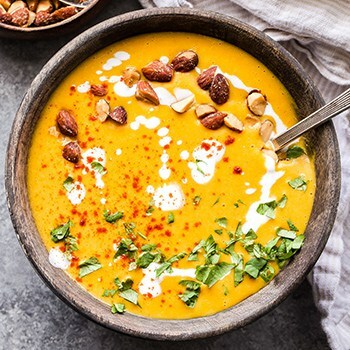 It adds a nice bit of tang to this Creamy Red Lentil Butternut Squash Soup and you won’t lose any of the creaminess of the soup by using Greek yogurt. In fact, I find that it actually makes the soup creamier! Adding Greek yogurt to my Slow Cooker Creamy Green Chile Chicken Enchilada Soup makes it extra creamy, too—without adding lots of extra calories. For a healthier take on sweet potato casserole, try my Cinnamon Maple Greek Yogurt Squash Casserole. In a large pot over medium heat, add the olive oil. Once the oil is hot, add in the onion and sauté just until soft, about 3 minutes. Add in the garlic and sauté another 30 seconds. Add in the butternut squash, cumin, smoked paprika, coriander, turmeric, kosher salt and black pepper. Stir everything together and sauté for another minute. Pour in the red lentils and vegetable broth and stir together. Bring to a boil, then turn down the heat and simmer for about 25 minutes until the squash and lentils are soft. Add the hot soup to a blender and purée until smooth. If your blender won't hold all of the soup, blend it in batches. Be careful not to fill the blender too full when blending hot soup to avoid the lid coming off. Once the soup is puréed, add the Greek yogurt to the soup in the blender and blend until incorporated and smooth. Serve the soup topped with chopped smoked almonds, cilantro, a drizzle of Greek yogurt and an extra sprinkle of smoked paprika. Hi, I’m Danae! I’m the blogger, photographer, recipe developer, and runner at Recipe Runner. 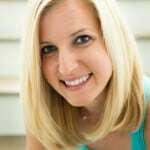 I’m an avid runner who loves to cook, bake, eat, and share healthy recipes with the occasional sweet treat. When I’m not sharing delicious recipes or tips on running, I enjoy sharing my latest travel adventures. I’m passionate about these aspects of my life and hope to encourage others to eat well, exercise often, explore and enjoy life to it’s fullest!